Prime Minister Narendra Modi has inaugurated a new airport at Jharsuguda, which will attract investors to the mineral-rich area. The Jharsuguda Airport has been developed by the Airports Authority of India in collaboration with Odisha government at an estimated cost of Rs 210 crore, with Rs 75 crore contribution from the state. The airport has been developed under the Centre’s UDAN scheme. Suresh Prabhakar Prabhu is the currently serving as the Minister of Commerce & Industry and Civil Aviation. 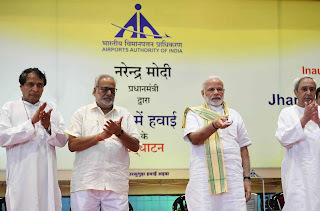 UDAN (Ude Desh Ka Aam Nagrik) is a Regional Connectivity Scheme. Naveen Patnaik is the current Chief Minister of Odisha.